This is one of my most treasured finds from Readercon, picked up from the fantastic Somewhere in Time Books: Tanith Lee‘s 1988 limited-edition novella, with illustrations by Tom Canty. From the title and pastel cover I expected a tale of genteel swashbuckling, possibly YA; should have remembered that Lee never goes in for gentility. Elegance, yes – Lee is manically elegant – but never gentility. The narrator is unemployed and evicted, and finds herself in dire straits, chased from one end of the socioeconomic spectrum to the other: too middle-class for hard labor, too unskilled to be a seamstress, too unwilling to accede to customers’ advances to be a waitress in the seedier cafés. At the extremity of her despair – enter Madame Two Swords, a black-eyed old woman of terrifying intensity, in whose museum-like house the narrator comes to some strange realizations. In this France, the Revolution was sparked by the poet-demagogue Lucien de Ceppays in the city of Troies. This Revolution culminated in the execution of the original revolutionaries, including de Ceppays, by the fickle mob, and the occupation of France by a fearful British monarchy. Inhabitants now speak “Frenish” as often as French, and labor in a depressed economy overseen by a puppet government. The narrator’s talisman-book is, of course, a volume of de Ceppays’ work, and contains besides a haunting watercolor portrait of him. The story quickly sees her devotion to his image and memory moving beyond girlish fantasy. The final supernatural twist, when it comes, is powerful in effect, in large part because of the supreme delicacy with which Lee constructs the fleeting image central to the revelation. There’s an also-delicate but definite touch of gender-bending, which I wish I could discuss in more detail without being spoilery, but suffice it to say that I liked how Lee addressed its implications, a lot. This is a story that makes use of deeply Gothic-Romantic tropes (duh, Tanith Lee) yet resists being just romantic; it’s fierce and intelligent and ultimately insists on the dignity of all of its characters. And so my love affair with Tanith Lee continues! If you like Revolutionary France and cross-lingual puns and intelligent Gothic fantasy, if you love Tanith Lee and beautiful books, you might consider treating yourself to a copy of Madame Two Swords. 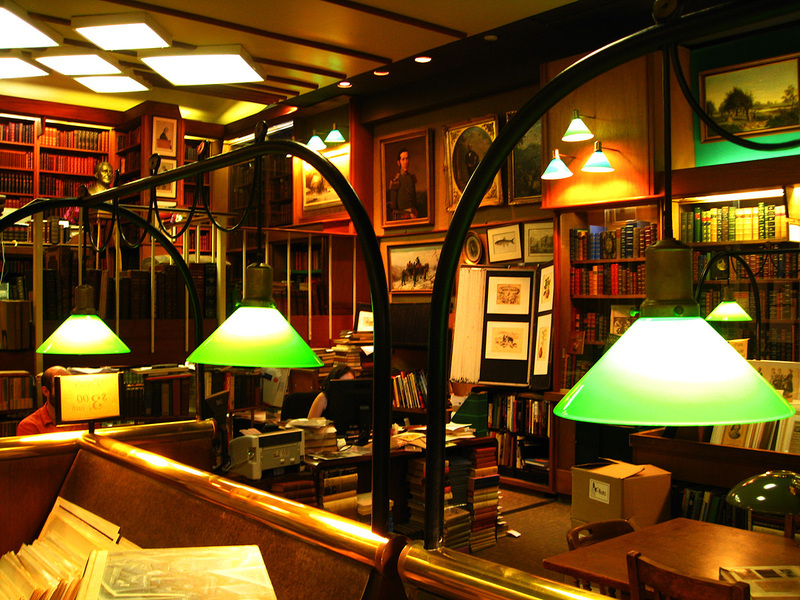 Book-repair station at the Strand in NYC; photo from when Kakaner and I visited together two years back. Readercon 22 took place Thursday – Sunday, July 14 – July 17, 2011; Kakaner and I made it to the associated reading at Porter Square Books in Cambridge on Thursday night, and Friday and Saturday of the con proper. This was her first literary con, and my first con of any sort, so needless to say we spent a lot of time being really, really, really excited. I’ll try to keep the frothing to a dignified minimum in our reports, though. Thursday night! A reading from the Ellen-Datlow-edited anthology of urban fantasy, Naked City, featuring a line-up of six authors that had K and I, as above, really etc. goddamn excited: Kit Reed, John Crowley, Jeffrey Ford, Matthew Kressel, Ellen Kushner, and Caitlín R. Kiernan. All images link to high-res versions. Editorial powerhouse Ellen Datlow introduces the collection. She explained that she hopes to reintroduce readers to urban fantasy as it used to be understood – e.g. the works of Charles de Lint, the Bordertown series – and do some work towards reclaiming the term from paranormal romances and magical detectives. Re: The Jim-Butcheriffic cover and prominent billing of other writers of said PR and magical detectives – “If it sells more copies, do you think I care?” Cover still gives me decidedly mixed emotions (guilty, compartmentalizing Dresden fan right here), but if Ellen Datlow can deal with it, so can I. Also, the totally flipping awesome cover for Supernatural Noir, another recently released Datlow collection, almost makes up for it. Brattle Street, Harvard Square, Cambridge, MA. I’m not sure how often it’s there; I’ve walked by it maybe twice now on good-weather days this spring and summer. Mirasol, formerly a beekeeper, has become the Chalice of her demesne, charged with binding and unifying both its inhabitants and its restive magical energies. Unfortunately, her demesne is unsettled by the violent deaths of its last Master and Chalice. The arrival of the new Master only promises more strife. Previously banished by his brother, the last Master, to the priesthood of fire, he returns more than a little inhuman, terrifying to his own people and perhaps unable to command the land’s magic as he should. More than any of McKinley’s other books that I can recall (except maybe Rose Daughter), Chalice has an elusive, vignette-ish quality to it. It feels as if we only spend a brief time with the characters and world before the curtain drops on the scene again. Mirasol’s world is rich with tradition and history – there are numerous mentions of a not-so-distant barbaric past, and Mirasol’s fellow Circle members have evocative, little-explained titles like “Talisman” and “Sunbrightener” – but we’re only privy to what detail Mirasol’s own experiences reveal. This guardedness lends the setting a pleasantly mysterious feel. On the other hand, I was not so much a fan of the intense internality that controls most of the book. The vast majority of it happens inside of Mirasol’s head, with dialogue and action indirectly reported, and flashbacks and occasionally repetitive exposition occupying much of the first half of the novel. So while I was deeply intrigued by the setting and circumstances, I felt a little stifled and not immediately involved. I was also put off by the flatness of the political conflict that eventually tests both Chalice and Master. I realize that for McKinley it’s always more about how her protagonists overcome difficulties, rather than what in particular they’re overcoming, but it can start to seem a little silly when all the villains are either greedy Overlords or mincing sycophants. Overall, though, I was happy to sit back and enjoy the ride, just soaking up the odd, earthy details of Mirasol’s life, the rituals that she concocts and carries out, and the few characters with whom she interacts. Also, the love story is very sweet. Throughout, McKinley wields crisp, vivid language that particularly helps to crystallize Mirasol’s experiences of magic. Chalice is not a must-read if you’re not already a big McKinley fan, but it is beautiful and ultimately satisfying, if on the slower side. The insides are just as beautiful, with colored text and chapter headers, and more of Grace Lin’s ornate, exuberant, full-color illustrations scattered throughout, complementing her detailed, lively prose. The story follows the adventures of Minli, a young girl who leaves her home in the shadow of the Fruitless Mountain to seek out the Old Man in the Moon, and learn from him how to change her family’s unhappy fortune. On the way, she helps and is helped by a varied cast of characters with cleverly interwoven stories to tell, including a talking goldfish with ambitions, a flightless dragon, and an orphan boy who lives with a water buffalo. Minli is sort of generically plucky and lovable, and occasionally the story’s sweetness borders on sappiness, but it’s all so clearly coming from a place of genuine caring that I can’t really complain. Lin’s attention to the grief of Minli’s parents after her disappearance is particularly striking and moving. Among children’s books, I can’t remember reading another Hero’s Journey that also gave page time to those left behind. Watching her parents (her mother in particular) come to their own realizations about their relationships with Minli, and then witnessing the family’s eventual reunion – again, just genuinely sweet, loving, and ultimately joyful. As always with really good YA, I wish I knew younger persons I could gift this to. Older readers looking for more books set in mythical China would do very well indeed to look up Barry Hughart’s rumbustious, madcap adventure-fantasy-mystery-everything-awesome series, The Chronicles of Master Li and Number Ten Ox, beginning with Bridge of Birds. Really nice space, complete with small couch-y area and prints etc. by local artists. Decent selection of sff, great selection of YA. I forgot to check out the poetry section, which gives me a good excuse to go back ASAP. In general, really carefully organized and curated. 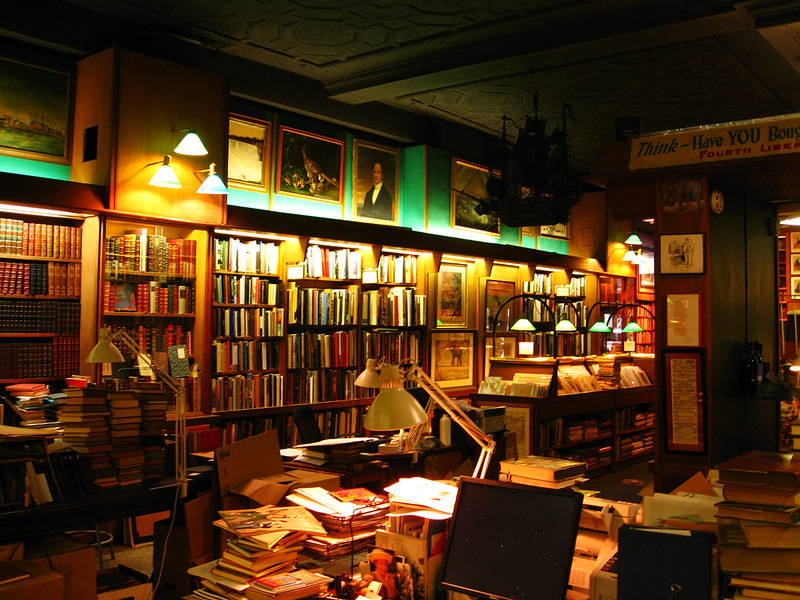 Since they have a lot of floor space, they don’t have the slightly frantic, overstuffed feeling that most used bookstores end up having. So, have some pictures of the book in the meantime. Maybe they’ll go partway towards communicating the extent to which I love this book. It’s not an outstandingly pretty edition, but there are so many little things I love about it: the size (it’s about the same height as but an inch or two wider than a modern mass-market paperback), the worn teal binding, the fact that it’s still printed in letterpress, the unmistakable dry sweetish old-book smell. 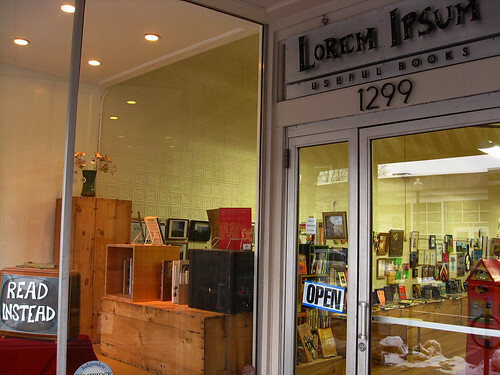 Also, it was one of the few things that I bought at the archetypal local bookstore-that-was-independent before the owners sold it in 2007. Anyone out there who can read Sanskrit…? Just two more photos under the jump. Everything immaculately labeled and presented, and gorgeously lit. (You can also see the store’s namesake dangling from the ceiling in the above photo – I neglected to take a better photo of it, but it was a marvelous model.) Very rich, very Old World.